Quickly create personalized, professional-looking labels with 14 fonts, 10 font styles, and over 600 symbols plus barcodes. 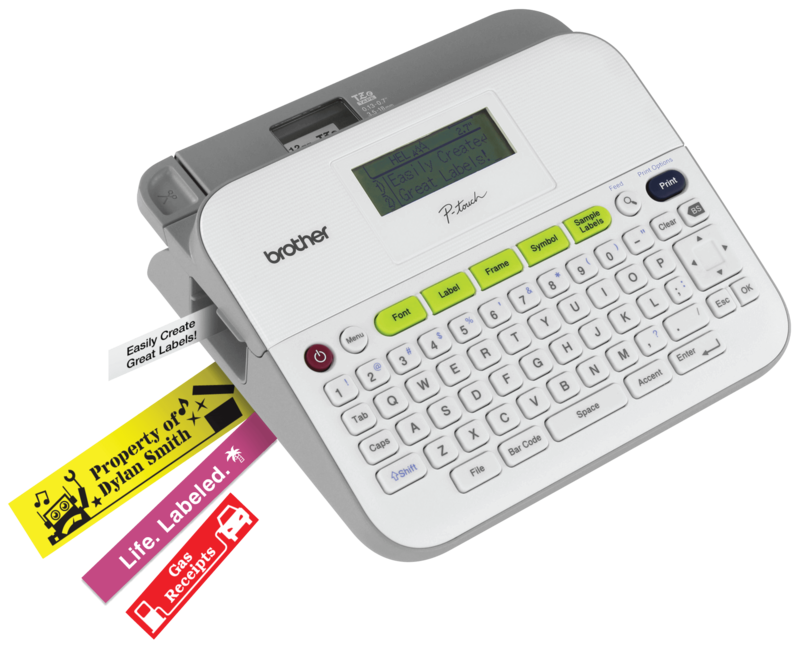 Use P-touch labels to help stay organized at work, at home and everywhere in between. Easy-type keyboard features large keys and an angled design for comfortable typing. This compact, versatile label maker can print up to five lines of text and graphics on TZe tapes up to 18mm wide, so it's ideal for a variety of label usages requiring durable labels that withstand water, heat, and fading. Large display lets you easily view text and layout. Intuitive one-touch keys support quick, easy label formatting. Built-in templates and up tp 50 label memory help save time with reprinting. Works with 4 different TZe tape widths. Convenient, top-loading tape cassettes let you easily change tape sizes and colors. Brother Genuine TZe durable laminated tapes can go from dishwasher to microwave and are great for both indoor and outdoor use. Shop Now! Unit Dimensions 7.4" x 7.0" x 2.8"
Carton Dimensions 3.9" x 8.9" x 12.3"
I am still learning all the new techniques on my brother but so far love it. confusing trtying to determine the size of the fonts and had to do a few labels over as the font was too big but love what I have learned so far. Gordon W a month ago Good labeler but could use some improvment. The labeler works well but wastes tape every time a label is printed unless a number of labels are printed at one time. I believe it could be more user friendly or instructions could be better but it does a good job once I figured out the basics. Advanced settings are more difficult taking too much time to figure out for how much I need to use them. It isn't as intuitive as I had hoped. After reading the instructions I could figure out the settings for basics. More advanced printing and settings take more expermintation after studying instructions and are harder to figure out. I have used it for single line labels for plastic storage drawers which it works well for. I also used it to make a label below the idiot lights on my tractor to identify them. The background was black so I got some black tape with white print to use there making the label look like oem. abel tape is expensive. I purchased this label maker after my old one [which i had for several years] finally died. This label maker has more features and makes the backs of the labels easier to peel off [which was much more difficult with the old one]. I make lots of labels so this will be most helpful to use. Got a question about PT-D400?